…and, unusually for what is often the dullest day in the whole year, it’s turning out to be one. Yes. I am very very happy at the moment. Both Luke and his housemate Adam (who is a good cook) were scathing about my excitement over a small piece of plastic. What neither of them realised is this: it is simply the best toy in the world. I have been walking around pretending to unlock doors and explode hidden landmines with it. On the tube I pretended I was making the doors open at each station with it. 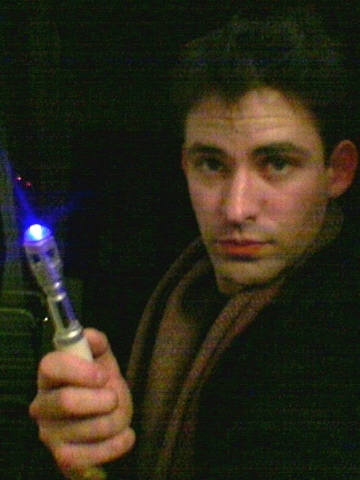 When the co-op down the road was closed I tried to open the doors with my sonic screwdriver, and when I ended up buying ingredients for dinner at the garage down the road I tried to pay the chip-and-pin machine with it. It is impossible to describe, particularly to those unfamiliar with the Doctor’s trusty instrument, just how much pleasure five and a half inches of plastic (six and a half when extended) can give you. A very happy new year to you all. I’m having one.